Tributes have been paid to ‘inseparable friends’ who were killed in a horror smash on the M62 motorway. The men, named locally as Adam Afsar and Jason Wilby, died when the car they were travelling in was struck by a vehicle in the early hours of Easter Monday. Reports on social media suggest the pair, aged 34 and 27, were best friends, with one commenter describing them as ‘inseparable’. Within a few hours of the accident Facebook was saturated with hundreds of tributes and messages of condolence, including a post from a colleague of Mr Afsar’s at Gany Electricals in Ossett. It has been reported that Mr Afsar was on the first day of a new job with Dewsbury company Harris Pets Transport when the crash happened. On Facebook, the Thornill-based firm confirmed one of their drivers was killed in the incident. They said: “We lost one of our drivers and his friend in the horrific M62 motorway accident. Our deepest condolences to the deceased’s family and friends. 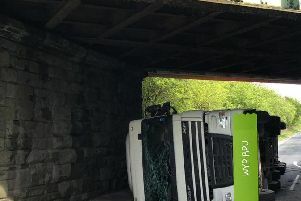 Police said they were called just after 2.30am, with a report of a vehicle driving the wrong way down the M62; travelling eastbound on the westbound carriageway at junction 26. Mr Afsar and Mr Wilby, from the Thornhill Lees area of Dewsbury, were found dead in a white Skoda Octavia when officers arrived at the scene. The other vehicle involved was a black Vauxhall Insignia. A Go Fund Me fundraising page hoping to provide financial support to the pair’s families collected nearly £5,000 within its first 24 hours. A second page has also collected more than £200.